A venue of considerable if slightly shabby charm, The Louisianna was heaving ( I guess 100 people can just about ‘heave’) for the combined talents of the Pictish Trail, Rozi Plain and James Yorkston – all associated with the Fence Collective. Its pretty much like having bands in your front room, intimate hardly covers it, but friendly, attentive and laid back it was for this most determinedly lo-fi of nights. I arrived too late for all but the last of the Pictish Trail’s (really just Johnny Lynch) set but it seemed to have gone down well with the supportive and enthusiastic crowd. Next up local girl Rozi Plain whose new album Inside Over Here was launched in October at the nearby Cube in Bristol – with some input from our own Peeblemeister. Stripped back to just her good self Rozi’s fragile songs shone with her mixture of diffidence and good humour. A couple of the songs didn’t quite do it for me, but then this was a first hearing for me for all her material, but others (some of which I can’t name) clearly had more depth and resilience – here I can remember one – Stolen Shark, performed with Mr Lynch, was a charming closing number. Mr Yorkston was for me even better live and on his own than on record. There was an immediacy to his performance, a greater accessibility to the melodies, a directness somehow. Often the beautiful recorded arrangments seem, despite their lightness, to somehow clutter the songs and make them harder to break into. Driving home after the show and listening back to the latest album, it seemed much clearer to me – maybe I am just gabbling now. Anyhow the set was nicely relaxed, with ocassional interruptions and asides, but the class of the playing and the quality of the songs was abundently clear. Mr Y said at one point after a minor technical issue that at least we could go away and report that ‘he’s not as good live as he is on record and his jokes are crap’ – well I thought he was better live and the jokes weren’t crap, rather human and warming I thought. The set was a nice mix of the new stuff and some old favourites, with Rozi and Mr Pictish joining in to enrich the sound. They all seemed to have agood time, the crowd would have had them play all night, but I stole away at 11.20 after the encore not knowing if they were enticed back for any more songs. 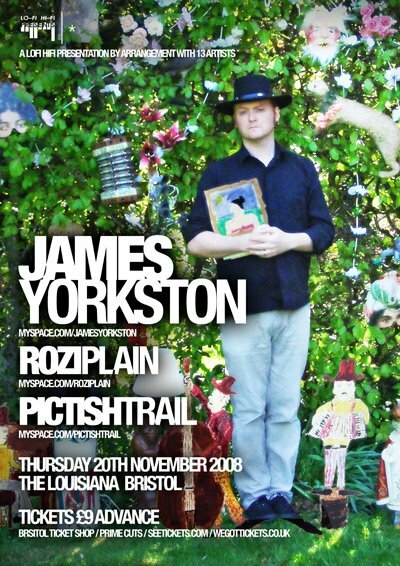 This entry was posted in Uncategorized and tagged Folk, Gig, James Yorkston, Pictish Trail, Rozi Plain. Bookmark the permalink.